Second only to the mighty Njal’s saga in number of manuscripts surviving, the ‘saga of the people of Laxdal’ is one of the classics of the genre. 1 – Introducing Ketil Flat-Nose and his wife Yngvild, and their five children: sons Bjorn the Easterner and Helgi Bjolan and daughters Unn the Deep-Minded, Thorunn, Jorunn Manvitsbrekka. 2 – After the Battle of Hafrsfjord (?875) King Harald Fair-Hair (872-930) emerged as the first king of a unified Norway. He imposed taxes and appointed lords and drove many people into exile. Ketil assembles his family and says he doesn’t want to submit to Harald. His sons Bjorn and Helgi are for going to Iceland, Ketil less keen. 3 – The sons and son-in-law arrive in west and north Iceland and claim land and build settlements. 4 – Ketil settles in Scotland with his kin (890). His grandson Thorstein goes a-viking around the Scottish coast. He eventually makes peace with the Scots but is killed. Ketil dies. Her father and son dead, Unn has a knorr built secretly and steals away with her people and goods. She sails to the Orkneys and settles Thorstein’s daughter, then on to the Faroes and arranges the marriage of another of Thorstein’s daughters. 5 – Unn sails to Iceland (895), arriving at Hvammsfjord and making her home at Hvamm. She marries Thorgerd daughter of Thorstein to Dala-Koll. Their son is Hoskuld Dala-Kollson whose daughter is Hallgerd ‘Long legs’, a central character in Njals’ saga where she manages to get her three husbands killed (notably the hero Gunnar) and then provides a focus for the enemies of Njal. 6 – Unn apportions land to all her followers, and the marriages of the rest of Thorstein the Red’s six daughters. 7 – Unn holds a big wedding feast for her grandson Olaf Feilan (920) at which she publicly leaves him the farm at Hvamm then goes to bed. In the morning she is found dead. She is buried in a boat in a mound along with lots of treasure. Dala-Koll dies and Hoskuld inherits what comes to be known as Hoskuldsstadir. His mother Thorgerd (now a widow) returns to Norway and marries Herjolf. 8 – Herjolf and Thorgerd have a son, Hrut. He grows up big and strong. Herjolf dies (923). Thorgerd returns to Iceland, to Hoskuldsstadir. Eventually she dies and Hoskuld takes over all her property. 9 – Hoskuld woos and marries Jorunn (935). Their sons were Thorleik and Bard; their daughters were Hallgerd long-legs and Thurid. Hoskuld becomes honoured and rich. 10 – A man called Hrapp lives at a farm across the river Laxal from Hoskuldsstadir. He is troublesome. His wife Vigdis and all her family and relations. 11 – A man called Thord Goddi is neighbour to Hrapp and comes into conflict with him. Hoskuld buys a ship and sails to Norway where he is welcomed by kin. 12 – In the summer a royal expedition east to the Brenno Islands to judge law cases, also an excuse for feasting and entertainment. Hoskuld goes. He encounters the trader Gilli the Russian. He barters for a slave woman, paying three marks of silver for one who cannot speak. 13 – Hoskuld presents himself to the newish ruler of Norway, Earl Hakon (975-995), who is a bit miffed he’s delayed saying hello, but helps him to the timber he requires and sends him back to Iceland laden with presents (gold ring and sword) (948). Hoskuld’s wife Jorunn is not thrilled to have Hoskuld’s slave woman under the same roof especially when she gives birth to a fine-looking boy, whom Hoskuld names Olaf after his uncle Olaf Feilan. Hoskuld discovers the dumb slave girl by a stream talking to handsome young Olaf, asks her name. She is Melkorka daughter of Myrkjarten, a king in Ireland, before she was captured in a raid aged fifteen. When she’s getting changed Jorunn hits her with a sock, Melkorka slaps her. Oops. Hoskuld separates them and gives Melkorka her own farm further up the Laxdal valley. 14 – Long story of overbearing Hall from the Saudeyjar Islands. He goes to the fishing camp on the Bjarneyjar islands, takes a fishing partner Thorolf and bullies him. The bullying reaches a climax after one trip where Hall claims the better half of the catch. Hall tries to hit him with a gaff, they are separated, Thorolf goes off disgruntled, Hall takes another partner. As Hall leaps off the boat after his next fishing expedition Thorolf is waiting, chops off his head, and scarpers. He takes a boat to the mainland, to the Laxa river and goes up to the house of Thord because Thord’s wife Vigdis is a distant relative. They argue about it but Vigdis gets her way to hide Thorolf for the winter. But then Hall’s overbearing brother, Ingjald, arrives and offers Thord three marks of silver if he will hand Thorolf over peacefully. 15 – Vigdis scents a trap and sends their servant Asgaut to take Thorolf from the cowshed where Thord has secreted him but they’re surprised by Ingjald and his men, and decide to swim across the half-frozen Laxa river, where Ingjald and his men can’t follow. They proceed on to the house of Thorolf Red-Nose where they are welcomed and Thorolf the fisherman becomes a retainer. Back at Thord’s house Ingjald is furious and demands the return of his money but Vigdis smacks it in his face and frightens him off. 16 – Vigdis gives Asgaut money and makes him a free man; he sails to Denmark, settles and is out of this saga. Vigdis divorces her cowardly husband, takes her half of the goods and goes to stay with her kin the leader of which, Thord Bellower, is not impressed. Thord goes begs Hoskuld for his help. He offers to foster Hoskuld’s illegitimate son, Olaf, making him his heir. Hoskuld agrees, dspite the objections of Olaf’s mother, the ex-slave woman Melkorka (950). Hoskuld sends a conciliatory message and money to Thord Bellower and this placates him. Olaf grows up to be big, strong and handsome, and Hoskuld gives him fine clothes, which leads to his nickname, the peacock. 17 – Unpopular Hrapp dies (950). He’d asked his wife (another Vigdis) to bury him upright in the doorway which she does. But he haunts the farm and area and kills his servants. Vigdis flees. Hoskuld digs up Hrapp’s body and reburies it far away. Hrapp’s son, Sumarlidid, takes over the farm but goes mad and dies. 18 – Thorstein moves his whole family east in a boat. Interesting details of Norse boat and sailing, currents etc. In the event it overturns and everyone is drowned bar one. Details of the deal Thorkel Scarf does with the survivor to make him tell the order of the drowning in such a way as to ensure that Thorkel inherits all the goods through his wife Gudrid, Thorstein’s daughter (who drowned). 19 – In the Laxdæla version Hrut is born and raised in Norway where he becomes a valued member of King Harald Gunnhildsson’s entourage, but he is called to Iceland to claim his inheritance, namely his mother’s share of the farm. Hoskuld is not pleased to see him, Hrut demands his mother’s share of the farm. Hoskuld replies that he was legally his mother’s guardian after his father’s death and did not give her permission to remarry (and thus split the property). Hrut is dissatisfied. In the autumn Hoskuld makes a visit and Hrut and his men go and rustle 20 of his cattle. Hoskuld’s men pursue and there is a pitched battle in which four of Hoskuld’s men are killed and the rest surrender. When Hoskuld finds out he is furious and sets about raising men from allies and supporters when his wife Jorunn intervenes: a) lots of people think Hrut was only taking his due and had showed retraint waiting so long b) Hoskuld has enemies such as Thord Bellower for taking Thord Goddi’s side against his wife. Hoskuld calms down and sees sense. He offers a settlement to Hrut. Hrut offers compensation for the men killed. The two are reconciled and live as brothers ought to. Hrut lives to a ripe old age at Hrutsstadir. 20 – Hoskuld is old. His son Thorleik builds his own farm and marries Gjaflaug. The other son Bard helps Hoskuld on his farm. Meanwhile Hoskuld is reluctant to help Melkorka on her farm, he says she has Olaf to help. Melkorka decides to get revenge for his neglect. She arranges a) to marry Thorbjorn Pockmark, at which point he will release treadeable goods for b) her son Olaf the Peacock to go to Ireland and find her father, the Irish king Myrkjarten. She gives him a gold arm ring which her father will remember and a knife and belt which her nurse will remember. 21 – Olaf sails to Norway where he is kindly received by King Harald and the Queen Mother Gunnhild who takes a shine to him (as she does to all attractive men). After faithful service Olaf requests help sailing to Ireland the the king and queen equip him with a boat and sixty men. After some trials in the fog and with reefs they anchor on the coast of Ireland. The locals threaten to storm the boat but Olaf puts up a stout defence and looks commanding in his golden helmet. The king is called and at a parlay Olaf realises it is his grandfather Myrkjarten. Recognising the golden arm band Myrkjarten acknowledges Olaf as his son and they ride to Dublin. Olaf fights for the king and proves a daring commander. So much so that at a massive assembly Myrkjarten declares Olaf his successor as king of Ireland. Olaf gracefully declines: ‘I would rather enjoy a brief spell of honour than a long rule of shame’. Olaf requests to return to Norway; the king gives him a spear, a sword and other wealth and Olaf arrives back in Norway. 22 – King Harald and Queen Gunnhild like him all over again and try to get him to stay but Olaf sails safely home to Iceland with another set of royal presents, and goes to stay with his father Hoskuld. He becomes famous. Melkorka asks if her nurse came with him but he has to say, regretfully, the king wouldn’t let her. Melkorka had married Thorbjorn Pockmark: they have a son, Lambi who grows up big and strong. Hoskuld says Olaf needs a wife. He suggests Thorgerd, daughter of Egil Skallagrimsson (who, of course, has a famous saga dedicated to him). 23 – At the Althing Hoskuld suggests to Egil who asks Thorgerd who refuses to marry the son of a slave. So Olaf himself visits Egil’s booth and gets talking to Thorgerd and she agrees. A sumptuous wedding feast is held as Hoskuldsstadir and Olaf gives Egil the sword given him by King Myrkjarten. 24 – Thord Goddi (Olaf’s fosterfather) dies. Olaf builds a mound over him. Olaf buys Killer-Hrapp’s vacant land, builds a farmhouse in a clearing, herds all his animals from Hoskuldsstadir to the new place which he calls Hjardaholt. One night a shepherd comes in terrified. Hrapp is haunting. Olaf attakcs Hrapp with a spear, Hrapp breaks off the spearhead and sinks into the ground. Olaf digs up Hrapp’s corpse (and finds the spearhead) and burns it by the sea. 25 – Hrut frees a slave and gives him land close to Hoskuld’s land. Hoskuld says it is his land. One day Thorleik kills the freeman. Hrut and his people are livid but the Law finds against them. Thorleik and Gaufljag have a bonny son, Bolli. 26 – Hoskuld is dying. He tells his sons Thorleik and Bard he’ll divide the legacy between them but wants to give Olaf the 12 ounces which the law allows an illegitimate son. Thorleik grudgingly agrees but then Hoskuld gives Olaf the gold armband and sword Myrkjarten gave him, 12 ounces of gold not the 12 ounces of silver that was customary. Thorleik was furious. Hoskuld dies and is buried. The brothers agree to hold a funeral feast after the next Althing. 27 – At the Law Rock Olaf promises a lavish feast, which irritates the brothers. In fact it IS an extravagant feast, with 1,080 guests, the second largest feast in Icelandic history. Afterwards, Olaf makes it up with Thorleik and offers to foster Thorleik’s son Bolli, since the foster-father acknowledges himself inferior. Thorleik is delighted so Bolli, aged 3, goes to Hjardarholt. 28 – Olaf and Thorgerd have a son, Kjartan, named for his maternal grandfather the Irish king. Dueller-Bersi offers to foster Olaf’s son Halldor. Kjartan is the handsomest man ever born in Iceland, tall and strong and excelling at physical sports etc like his grandfather Egil Skallagrimsson. Bolli is the second-finest man in Iceland. 30 – After three years Geirmund announces he is abandoning Thurid and their daughter Groa. Thorgerd and Thurid are furious. Olaf is more relaxed and gives Geirmund a boat to return to Norway in. It is becalmed off islands in the fjord. Thurid follows it with servants, gets them to puncture the tow boat, then steals aboard, takes Geirmund’s beloved sword, ‘Leg-Biter’, and leaves the baby. When Groa starts crying Geirmund, wakes, runs on deck and begs the departing Thurid to return his sword. Never, she yells. Whereupon Geirmund curses the sword and says it will kill the one she loves most. Back at Hjardarholt Thurid gives Leg-Biter to her cousin Bolli. Geirmund sails on to Norway where his ship is wrecked and everyone aboard drowns (including, presumably, one-year-old Groa). 31 – Thurid remarries, to Gudmund Solmundsson and bears the sons Hall, Bardi, Stein and Staingrim. Details of the marriages of Olaf’s other daughters. Olaf has a magnificent oxen named Harri. At age 18 he has it slaughtered. That night a woman comes to him in a dream and says you have had my son killed and returned him to me mutilated. For that I will see your son drenched and blood and by the person you wojuld least wish to. 32 – Osvif Helgasson and his kin at Laugur in Saelingsdale. His daughter, Gudrun Osvifs-daughter, the most beautiful and intelligent woman in Iceland. 33 – Gudrun tells wise Gest Oddleifson her four dreams: he interprets them that she will have four husbands and they will all die. Later he rides past Bolli and Kjartan swimming in the river along with other boys. He points them out to Olaf and chats to him. they ride on and his son notices him weeping: he explains he foresees Bolli stooping over Kjartan’s corpse. 34 – Gudrun is wooed and married by Thorvald Halldorsson. She is a prickly wife, alwa demanding the finest jewellery. Rumour gets round she’s seeing a lot of Thord Ingunnarsson leading Thorvald to argue with Gudrun and slap her. Outraged, she divorces him, takes half his property and returns to Osvif. 35 – Gudrun persuades Thord to divorce his wife Aud for wearing trousers. She is upset and her brothers are furious. Gudrun and Thord are married a a big feast. Later Aud sneaks to the homestead where Thord is sleeping and delivers a mighty sword blow which permanently damages his arm. Thord recovers in time for his mother Ingunn to come complain about her neighbour Kotkel and wife and sons who are wizards and pestering her. Thord takes a boat and loads all her belongings aboard then rides to confront Kotkel and family of being wizards, a crime which demands full outlawry, then rides back and boards the ship. Kotkel and sons mount a wizard platform and make incantations and spells. Thord’s boat, his mother and servants and all their belongings are drowned and lost. 36 – Gudrun is grief-stricken, gives birth to Thord’s son and calls him Thord. Snorri the Godi from Helgafell offers to foster Thord who becomes known as the Cat. Kotkel and family are driven out of the north and travel south where they manage to inveigle Thorleik Hoskuldsson into letting them stay in exchange for some fine stallions. Osvif, Gudrun and her brothers are outraged and want to kill Kotkel but Snorri the Godi suggests calm; Thorleik will pay the price. 37 – At the Althing a big man named Eldgrim makes Thorleik an offer for the horses which he refuses. They argue, Eldgrim threatening to steal them. One day one of Hrut’s servants reports a big man taking Thorleik’s horses. Hrut rides down to confront him. Hrut is 80 years old. They argue. Hrut kills Eldgrim with one blow of his halberd. Thorleik is very cross and feels he’s been shamed. He commissions Kotkel to go work magic on Hrut. Hrut and his household hear musical chants outside. They all fall asleep except for Hrut’s son Kari who goes outside and is struck dead by the magic. When they wake and find the body Hrut is devastated. He rides to Olaf the Peacock suggesting violent action against Kotkel and Thorleik. Olaf says it would be bad for kin to fight and he would have to defend Thorleik. Instead they ride after Kotkel and his sons. Stigandi gets away. Kotkel and son are captured and stoned to death. They take Hallbjorn Slickstone-eye out into the fjord and drown him with a rock around his neck. But not before he looks back to Kambsnes and curses Thorleik and his farm (a curse which many later remember). 38 – Stigandi becomes an outlaw and a nuisance. Olaf helps bribe a shepherdess to trap him. They put a sack over his head then stone him to death. Slickstone-eye’s body washes up ashore, it’s buried but haunts the area. Olaf goes see Thorleik and persuades him to emigrate. Thorleik sells the farm at Kambsnes and sails to Norway, then on to Denmark and Gotland and he is out of this saga. 39 – Kjartan and Bolli regularly go to the hot springs at Laugur in Saelingsdal where Kjartan enjoys talking to Gudrun. And Olaf and Gudrun’s father Osvif are friendly. 40 – Kjartan decides to go abroad. He buys a half share in a boat. His father Olaf Peacock does not approve. Neither it turns out does Gudrun. She asks to go with him but he says her family need her. He says, wait for three years and she angrily refuses. Kjartan and Bolli sail to Norway. they discover Earl Hakon has been replaced by King Olaf Tryggvasson (995-1000) who is insisting everyone convert to the new religion. All the Icelanders in port make a pact to refuse to convert. One day they see lots of people swimming. There is one strong swimmer. Kjartan dives in and has, what appears to count for a swimming competition which is to see how long you can hold the other guy under. Three times Kjartan struggles with the stranger. Upon resurfacing it turns out it is King Tryggvasson! When they dress the king gives Kjartan a fine cloak as a gift. The king stays in the neighbourhood making speeches exhorting people to convert. Kjartan and Bolli discuss their response and Kjartan is hot headed and says they must resist and even burn the king’s house down. Olaf has spies everywhere and at the next assembly asks who said his house must be burnt down? Kjartan steps forward to admit it but refuses to convert. Olaf’s advisers say Force him but Olaf sees that Kjartan’s volunatry conversion will mean more to his men and his kin in Iceland than threats. Finally Kjartan and his men go to observe the Christmas feast and find their hearts turned. They all ask to be baptised. Kjartan and Bolli become liegemen to the king. 42 – After they have come to do fealty to him Olaf sends Gizur and Hjalti back to Iceland as missionaries. Bolli goes with them but Kjartan is kept by the king as a hostage. Bolli hints that Kjartan has been friendly with the king’s sister Ingibjorg. Gizur and Hjalti speak well at the Althing and convert Iceland 🙂 Bolli is warmly received back at Hjardarholt with uncle Olaf. He rides over to see Gudrun often and even tentatively proposes but Gudrun says she will never consider another man while Kjartan is alive. Bolli tells her (as he’d promised not to) that Kjartan may be warm for Ingibjorg. 43 – Bolli persuades Osvif to let him marry Gudrun; she is not keen at all. Olaf is also not keen, knowing how people associated Gudrun with Kjartan. But Bolli overrides them all and marries Gudrun at a big feast. Meanwhile the missionaries arrive back in Norway to tell King Olaf that Iceland is converted and he releases the hostages including Kjartan. Kjartan says an ambiguous goodbye to Ingibjorg who gives him a luxury white head-dress to give Gudrun, and Olaf gives him a sword, he will never die while he bears it. 44 – Kjartan and Kalf arrive back in Iceland with their goods. Kjartan learns his foster-brother Bolli has married Gudrun and shows no response. Kalf tells his lovely sister Hrefna she can have her pick of the treasure and while the men are out she finds and choses the white head-dress given by Ingibjorg. On their return Kalf says No she can’t have it but Kjartan says sure she can, he’d like to have the head-dress and the pretty head under it. Hrefna is puzzled by his listless proposal and doesn’t accept it. Kjartan is joyously welcomed by his father Olaf. Bolli and Gudrun invite Kjartan to come and stay and Osvif and Olaf traditionally host each other at feasts so the Hjardaholt people are incited to Laugar. Gudrun tells Bolli he wasn’t truthful about Kjartan’s feelings: she is unhappy. Kjartan doesn’t want to go but Olaf persuades him and he puts on a gold helmet and shield, the sword King’s Gift. 45 – Kjartan really doesn’t enjoy the feast. Bolli offers him the finest stallion from his herd but Kjartan refuses. Twice. They part badly. Then Olaf and Kjartan travel north to the home of Gudmund the Powerful and his son Hall, where they are richly entertained and take part in games. Kjartan’s sister Thurid matchmakes: why not marry Hrefna: she is pretty, her father is good, he’s good friends with her brother. 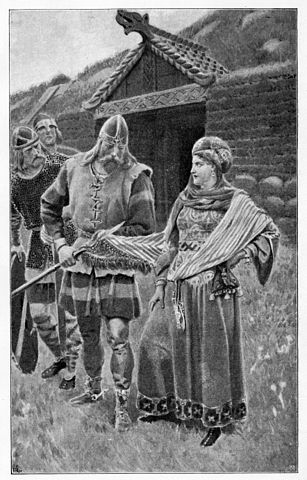 Kjartan is won round and marries her with a massive wedding feast at Hjardaholt which lasts a week, and Hrefna gets to wear the white head-dress with eight ounces of gold woven into it. 46 – Olaf and Osvir alternate hosting feasts. At Olaf’s feast Kjartan disputes which wife will get the seat of precedence. Then Kjartan’s sword goes missing. Servants accompany Osvir’s crew home and some of the men detour to a pond/bushes and, later, coming back, the servant finds the sword there. Olaf counsels discretion. A season later the Hjardaholt people go to Laugar. During the festivities the famous white head-dress goes missing. It is never found. this time Kjartan speaks up and accuses Bolli and his people of being thieves. 47 – That Christmas Kjartan takes 60 men from Hjardaholt and blockades the longhouse at Laugar. People had outside privies. The Laugar people are all forced to pee and poo inside the house for three days. Then Kjartan rides home. Olaf is unhappy. The Osvifssons want revenge. Thorarin wants to sell his farm at Tongue and get away from the growing tension. It’s perfect for Bolli and Gudrun who offer a good price and Thorarin agrees, though without witnesses. As soon as Kjartan hears about it he rides to Tongue and offers the same high price, with witnesses, and says he means to be master of the area. Reluctantly Thorarin accedes. Kjartan makes him ride up to Saurbaer to assign debts owed to him to Thorarin as payment. Thorhalla Chatterbox happened to be at Tongue when Kjaltan arrived and overheard his plans and the route he is taking. Gudrun says to Thorhalla Kjartan can afford to be puffed up since noone ever intervenes no matter how much offence he gives. The Osvifssons overhear and are shamed. 48 – Kjartan is at Hol in the north. An has a dream that a witchy woman opens his chest with a cleaver, empties his entrails and fills his gut with twigs. they all joke about it but mother Aud warns Kjartan to take extra men for the return journey south. Reluctantly he agrees for the sons Thorkel Pup and Knut to accompany him. But half way down the Svinavald valley, at the shielings called Nordursel, Kjartan tells them to go back. Which is a shame because Gudrun has spent the day shaming and goading her brothers into taking revenge and they are lying in ambush for him further down the valley. 49 – Kjartan continues south. A man named Thorkel of Hafratindar can see both Kjartan riding and the assassins waiting. His shepherd boy says they should warn him. Thorkel says, Let’s watch. The Osvifssons attack but can’t get to Kjartan. An the Black holds them off at the cost of having his intestines ripped out. The Osvifssons goad Bolli who eventually, reluctantly, draws Leg-Biter. Kjartan drops his sword. Bolli deals Kjartan his death blow. Bolli returns and tells Gudrun. The Osvifssons go into hiding. Olaf forbids his sons killing Bolli, instead they sail to find Thorhalla’s two sons and kill them. 50 – Olaf sends men to Laugar to protect Bolli. Family and allies assemble furiously angry, but Olaf counsels retraint. 51 – At the Thorsness Assembly Olaf secures exile for all the Osvifssons. Three years later he dies. His son Halldor takes over the farm at Hjardarholt, with Olaf’s widow, Thorgerd, consumed with hatred for Bolli. 52 – Gudrun and Bolli thrive at their new farm and have a son, Thorleik. Thorgerd taunts Halldor into murdering Thorkel of Hafratindar, the man who watched Kjartan ride to his death. 53 – thorgerd has Halldor and Steinthor accompany her on a trip north past Saelingsdaltunga, the farm of Bolli and Gurdun, where she taunts her sons, saying how ashamed Egil Skallagrimsson would have been of them. An Althing. The Olafssons invite Bardi Gudmandarson home with them. 54 – Halldor and the three other Olafssons, Lambi his father’s half-brother, Bardi, Thorstein the Black and Helgi his brother-in-law, An Twig-Belly as well as Thorgerd the vengeful mother, ride to kill Bolli. 55 – They find Bolli and Gudrun in the sheiling, all the farmers gone out to hay. A short fight ends with Steinthor Olafsson decapitating Bolli. Helgi Hardbeinsson wipes his bloody spear on Gudrun’s shawl. 56 – Gudrun and Osvif call for Snorri the Godi who comes with advice. Part of that is they exchange houses, Snorri moving to Tunga while Gudrun and Osvif move across the fjord to Helgafell (setting of much of Eyrbyggja Saga). 57 – Thorgills Holluson woos Gudrun; she lets her son Thorleik stay and learn law with him. A rich merchant Thorkel Eyjolfsson carries out a feud-vengeance attack on an outlaw called Grim using the sword Skofnung. 58 – But the attack goes wrong and Grim comes out better. But refuses to kill him. They make peace and ride to Snorri who congratulates them and suggeste Thorkel propose to Gudrun. Thorkel takes Grim to Norway where he becomes successful. 59 – It is twelve years since Bolli’s death. Gudrun and Snorri have a sneaky conversation in which a) they agree to make Lambi and Thorstein an offer, namely help us kill Helgi and live b) Gudrun will offer marriage to Thorgils Holluson to make him lead the attack, but she will make her promise to marry him of all the men in Iceland – all the while meaning to really marry Thorkel who is in Norway. 60 – Gudrun taunts her sons Thorleik (16) and Bolli (12) and makes the tricky promise of marriage to Thorgils in echange for getting him to lead the attack on Helgi. 61 – Thorgils persuades Thorstein the Black and Lambi to make reparation to Bolli’s sons and avoid risk to themselves if they join the expedition to kill Helgi. 62 – Ten men ride to kill Helgi. At his farm men tell them he’s up at his sheiling. 63 – Along chapter in which a shepherd gives an unusually detailed description of the appearance of each of the attackers. Helgi sends the women back to his farm to get help. At the last minute a funny little man named Hrapp rides up to help Thorgils and his crew. 64 – Big fight at Helgi’s sheiling. He is killed by Bolli Bollasson with Leg-Biter along with two other fatalities. 65 – Lambi and Thorstein the Black are extremely unpopular with their own side. Thorgils and Gudrun’s sons return to Helgafell where Gudrun is delighted. At this point she reveals the trick-promise to Thorgills and he leaves, furious. 66 – Osvif dies and is buried in the church in Helgafell. Gest Oddleifson also dies and his body transported across the icebound Breidafjord to lie in the same grave, two wise and good men together. 67 – Thorgils and Thorstein the Black visit Helgi’s sons and come to an honourable settlement. They ride to the Althing to settle up. Thorgils is counting silver when Audgisl Thorarinsson comes up and chops his head off for depriving his father of a godord. They had come to complain to Snorri who had a) said it’s about time someone dealt with Thorgils b) given Audgisl an axe ie more or less commissioned the murder. 68 – Thorkel Eyjolfsson returns a rich man from abroad. Snorri says propose to Gudrun (having disposed of the rival Thorgils). Thorkel does and after consulting her sons, Gudrin says yes. Big wedding feast. 69 – An outlaw named Thidbrandabani is at the wedding feast and it turns out Thorkel has promised to kill him to avenge and kinsman but Gudrun says he must be protected at all costs and a massacre nearly breaks out at the feast, until halted by Snorri. Gifts for the departing guests. Snorri invites young Bolli Bollason to come stay with him. Thorkel improves the farm, rebuilding the hall. Gudrun asks him to give the outlaw Gunnar all he wants to Thorkel gives him his merchant ship and money and Gunnar sails to Norway where he becomes a successful wealthy man. 70 – Thorleik wants to make his way in the world and sails to Norway where he enters the service of King (saint) Olaf. When Bolli comes of age he asks his step-father Thorkel to intercede on his behalf with Snorri to secure marriage with Snorri’s daughter Thordis. they are married. Big feast. Thorleik returns home rich. 71 – The reunited brothers are as thick as thieves all summer and when Snorri asks them what they’re planning they tell him a revenge attack on the Olafssons for killing Bolli. Snorri works his magic and effects a settlement between the Bollassons and the Olafssons. Money is paid and Halldor gives Bolli a fine sword and Steinthor gives Thorleik a fine shield. 72 – Then Bolli wants to go abroad. Snorri gives him portable wealth. Bolli buys the other half of the ship Thorleik owns, so it is totally owned by the brothers. 73 – They sail to Norway. Bolli arrogantly delays going to see the ruling King Olaf the Saint. Eventually they do and Olaf is impressed with Bolli and takes him into his service. Eventually Bolli asks leave to travel south, to Denmark, and then he voyages to Constantinople to become part of the Varangian Guard. 74 – Thorkel sails to Norway to collect timber to build a church in Helgafell. (This is made more poignant if you know that Helgafell which features so largely in this saga and Eyrbyggja saga was to become one of the early centres of Christian learning in Iceland.) He is greeted warmly by King Olaf but they argue when Thorkel plans his church to the same dimensions as Olaf’s ie refuses to back down. Nonetheless he sails back to Helgafell and holds a sumptuous feast. 75 – Strange diversion: Thorkel rides north to collect his wood, collecting his kinsman Thorstein on the way: they detour to Hjardarholt where they try to persuade Halldor to sell them his land, but he rejects them and they quickly become angry, in fact they would have attacked him had he not had his kinsman Beinar standing behind them with a large axe. 76 – Thorkel is returning with the ship full of timber when it founders in high seas and he and all aboard are drowned. At that moment Gudrun sees a ghost as she enters church. As she exits she sees Thorkel and his crew all dripping wet but when she gets home they are not there, then someone brings news of the drowning. Gellir is 14 and takes over running the farm. Gudrun becomes very religious, becoming the first woman in Iceland to learn the Psalter. She spends long periods in the church praying. 77 – Four years later Bolli Bollasson returns to Iceland in high, exotic style, dressed in gold with a fine helmet and shield. He greets his mother, then rides on to stay with his father-in-law Snorri. 78 – The last chapter is elegiac, dealing with the deaths of these great people, first Snorri old and full of years. Then the aged Gudrun, having become Iceland’s first nun and anchorite. Gellir becomes a rich man, much honoured and in later life undertakes a pilgrimage to Rome, dying on the way home. He had two sons, one Thorgils who had a son who was Ari the Learned (1067–1148), Iceland’s most prominent medieval chronicler, author of Íslendingabók which details the histories of the families who settled Iceland. Thus the saga which began in the dark, pagan and illiterate times of King Harald Fair-Hair, ends 150 years later in the light of educated, Christian historians, having traversed what feels like vast distances in time, space and emotion.